Sundae is the daughter of Dan and Suzanne Duyssen of LeRoy, NY. She is in first grade in LeRoy where she has many friends. Sundae was diagnosed with Congenital Myopathy, a form of Muscular Dystrophy, when she was 2 years old. When Sundae was a year old, her mom, Suzanne, realized she was not reaching her milestones. When Suzanne mentioned this to their pediatrician, they were referred to Children’s Neurology at Strong Memorial Hospital. After seeing the doctors in Children’s Neurology, they were then referred to adult Neurology where they had specialists for Muscular Dystrophy. In order to determine what type of Muscular Dystrophy Sundae had, a muscle biopsy had to be performed, but could not be done until she was 2 years old. Sundae has never been able to walk and has utilized a wheelchair since she was 2 1/2. Since being diagnosed, Sundae has spent quite a bit of time in the PICU at Strong Memorial Hospital. For the last 2 years, she has been hospitalized for complications with pneumonia and had to be intubated. In 2011, she was in the PICU for 41 days. Her immune system is not as strong as a “healthy” child, so every winter, it is a struggle for Sundae to stay healthy. Sundae attends physical and occupational therapy, spending about 4-6 hours a week with her therapists. Fortunately for Sundae this can all be done at the school she attends. They perform therapy in her classroom so that she is not missing out on learning with her peers. She utilizes a “sit-to-stand” in her classroom – this helps strengthen her leg muscles by helping her to stand, but when she becomes fatigued, it allows her to sit down. Sundae loves to read, listen to her ipod (she loves country music), and draw. She also loves to dance. After seeing her cousin, Lily, perform in a dance recital in 2012, she mentioned that she wanted to dance, but didn’t think she could because, as she said, “I don’t have three arms” … Her thinking – she needed that third arm to control the wheelchair while using her 2 arms to “dance”. She never said what most people would say – “I wish I could walk, so that I could dance”. Lily’s mom, Kelly Stalica, inquired at the dance studio, Fusion Dance, on whether they would accept Sundae as a student. They willingly accepted her into their Jazz Ballet class, with her cousin Lily. 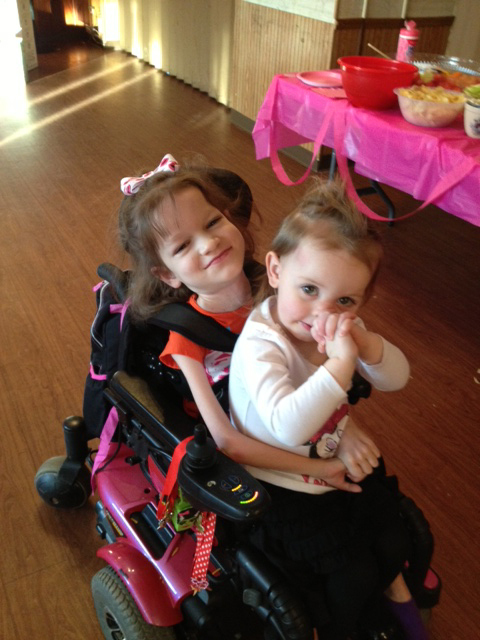 They are now scheduled to perform their recital in June of this year – Sundae will “dance” in her wheelchair, side-by-side with her cousin and friends. 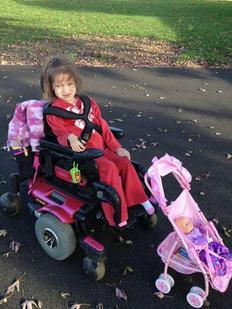 Through the MDA, Sundae has been loaned a stander in the past through their “loan closet”, and they have given Sundae many opportunities – this year she is eligible to attend the MDA Summer Camp.